Go ahead, have another serving for breakfast. We won’t tell. Yields: 8 to 10 servings. Line the bottom of a 9 x 13-inch baking dish with half the pie dough and refrigerate. If using store-bought pie rounds, piece together 1½ rounds to cover the bottom of the dish. Place whole sweet potatoes in a large, heavy saucepan. Cover with cold water, season with salt, and simmer until tender. Transfer sweet potatoes to a plate. When cool, slice sweet potatoes thinly. Reserve cooking water. Preheat oven to 375˚. Remove baking dish from refrigerator and layer sliced sweet potatoes on top of dough. In a medium bowl, mix the sugar, sorghum molasses, flour, and butter with 1½ cups of the cooking water and pour over sweet potatoes. 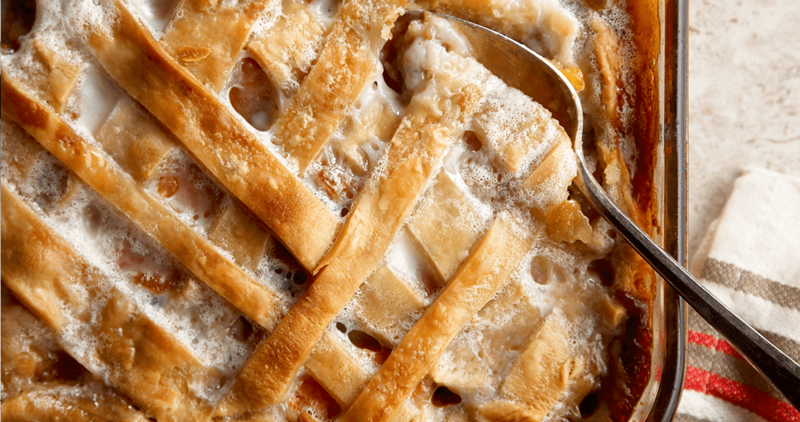 Use remaining pie dough to form a lattice-top crust. Bake for about 40 minutes, or until brown. In a medium saucepan, whisk ½ cup of the milk into the cornstarch until completely dissolved, then whisk in remaining milk and the sugar. Boil gently for 1 minute to thicken, then remove from heat and add vanilla. When the sonker is golden brown, remove it from the oven, pour 2 cups of the milk dip over the whole thing, and cook for another 15 minutes or until caramelized around the edges and brown on top. Let cool before serving. Pass the remaining warm milk dip in a small pitcher with the cobbler.